From the top of the promontory it was once the tip of, The Old Man of Hoy wasn’t so intimidating but, with each precarious step down the shattered cliff, it grew, so by the time we were standing on the rockfall causeway that once formed its arch, the sea stack’s stated height of 450 feet seemed an underestimate. What vision I have left is like looking into a smoke-filled room through a keyhole – I catch glimpses of parts of things and, if they don’t move, I can sometimes make them out, especially those at the lower end of the colour spectrum. The deep red of the Orcadian sandstone was the colour of dried blood, and just as static – it was breathtaking. Martin Moran, who was to lead the five pitches, set off first, his rack of protection jangling like wind chimes as he rose up the broken staircase to the first belay and giving me a rough idea of the line he was taking. After quarter of an hour I felt three tugs on my rope and it was my turn. A final check of my gear from Nick Carter who was to climb alongside me and ensure I didn’t stray off-piste, and I was off. With the sun burning through the morning mist and the incoming tide beating behind me my fingers searched for good holds, testing the strength of the slowly decaying rock; my feet seeking the cracks and features my hands had just used. The second pitch is the crux – the hard one that decides whether you reach the summit or get thrown off. A slippery traverse down a narrow ledge with only an impossibly delicate flake of rock to hold onto as you bridge a two foot wide void 150 feet above the pounding Atlantic; inching towards a corner chimney that’s lined with loose material and topped by an overhang whose reward is to land you into a bottomless chimney known as The Coffin – a name I only came to appreciate when I tried to climb out from under its roof, the Old Man’s mighty overhanging belly. Jamming one arm into a wide crack above my head and wedging a foot on the sandy wall behind me I began to lever myself up and out. I flung out my free hand and groped for a decent hold, willing my aching muscles to defy the pull of gravity for a few more seconds. My foot started to slip, my heart was pounding and finally my fingers closed on a nubbin of rock. With a great heave I hauled myself out and over. After that the third pitch for all the loose rock and angry, projectile vomiting fulmars was a joy; a ledgy crack climb to a glorious niche belay with, Nick assured me, a fine view of Long Hope. The fourth pitch was like a geology lesson, my fingers spoilt for choice with the different textures in the beautifully stratified wall that included arcs of rock-iron, as if someone had buried sections of iron drainpipe amid the sandstone, and which provide the best side-pulls known to mankind. I shared the fourth belay with a puffin who landed on the next ledge down from me with his fish lunch just as I was enjoying my own snack. His noisy munching made the ledge, which is littered with the rusting carabiners and frayed slings of previous climbs seem less eerie. I will never forget the fifth and final pitch – a sixty-foot bridge and haul up a bulging dihedral that feels a bit like climbing the flying buttress of a cathedral. About ten minutes in, a particularly bulbous section pushed me back and out over the sea, leaving me fist and knee-jamming the corner crack and flailing for both a hand and foothold on my left. Quickly finding both and my balance again I mantled up over the top to be greeted by a gust of wind and bright sunshine. For a moment I thought I must have twisted round on my rope; Martin and Nick were still some way above me so I couldn’t have hit the summit yet! Then it dawned on me – this was the cleft at the top of The Old Man; an eight inch wide split running twenty feet down, as if some giant had taken an axe to the sea stack and tried to split it in two. Even on as calm a day as this the wind whistles through straight off the Atlantic. There was something so elemental and beautiful about the contrast in exposure and shelter that I had to stop and catch my feelings. Five minutes later I was clambering across the shattered rocks and hardy grass at the summit towards the Tupperware box that holds the logbook. Leaving the malt loaf it also contains for someone hungrier than me, I scribbled ‘Red Szell – first blind man to climb the Old Man’. Thirty years before I’d seen Joe Brown and Chris Bonnington standing here in a TV documentary and had thought ‘I want to climb that too one day’. In the intervening years I’d discovered I had RP, lost 95% of my sight, given up climbing for nearly two decades and only rediscovered it through London’s indoor climbing walls. As I stood there, buffeted by the wind, I reflected on the strange routes our dreams take before sometimes coming true and how climbing has helped me out of a hole. 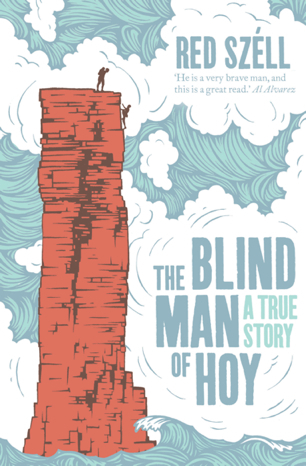 On the Face of it, househusband Joe Wynde has it all – apart from his sight. Robbed of 90% of his vision by a degenerative eye disorder, Joe’s goals, are simple: to raise his two sassy daughters properly while avoiding close physical contact with street furniture and bored banker’s wives. Compared to the lifestyles of his wealthy neighbours this may seem unglamorous, but with financial crisis rocking the city, some of them are going to discover just how exposed they are. When Joe is falsely accused of driving a fellow stay-at-home dad to suicide, he turns to unrequited old flame Miranda Letherbridge for support. A journalist with a keen nose for local gossip, she smells a conspiracy, which draws them into a web of illicit affairs blackmail amidst London’s wealthy elite. A racket others will protect at all costs. 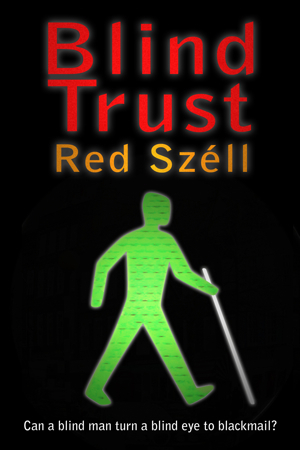 Blind Trust is a slow-burning thriller providing a unique insight into the world of those deprived of their major sense, while casting a wry glance at the nature of wealth.